We partnered with AOGsmart to develop a solution to Aircraft On the Ground (AOG) situations, which cost the aviation industry billions of pounds every year. The responsive web-based application is designed to provide airlines with fast, efficient and cost-effective solutions. Airlines have access to a previously 'hidden' and untapped live global market for parts, tooling, logistics and supply-chain services. The innovative tool enables users to connect with multi-tier supply-chains around the world for real-time trading. 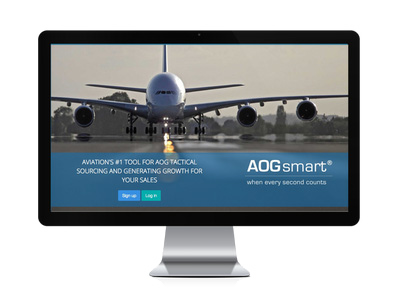 The 'AOGsmart Tool' holds huge opportunities and benefits for both suppliers and airlines, for whom the potential annual savings are in the millions. We're really excited about extending the platform's capabilities over the next few months as trading activity increases and seeing the real impact this revolutionary tool has on the aviation industry as a whole. To find out more about AOGsmart read our case study. Having DabApps on board has been invaluable to the development of the 'AOGsmart Tool' and we're thrilled to have launched the Beta version of AOGsmart.com. The team has worked tirelessly to create a fantastic user-friendly interface whilst understanding and supporting our business goals throughout the development. We're looking forward to receiving feedback from some high-profile industry players, including Thomson Airways, Air France and Qatar Airways, who will be testing the tool over the coming months.